I can’t believe we are only one week away from Thanksgiving. November is flying by and before we know it, it will be Christmas! (I surely hope everyone else is more on top of their Christmas shopping than what I am…) I try not to be a procrastinator with this kind of stuff, but unfortunately it seems to be happening this year. However, before we think too much about next month’s holiday, we need to talk about Thanksgiving! 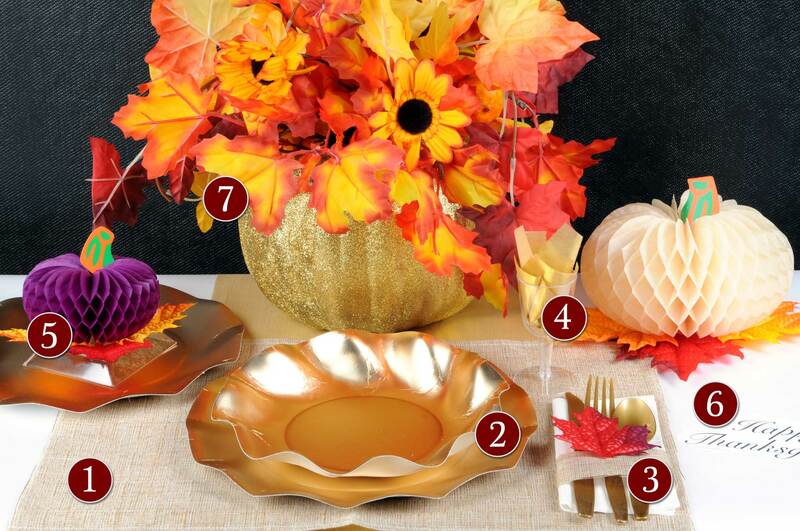 Have you thought about how you are going to decorate your Thanksgiving table this year? 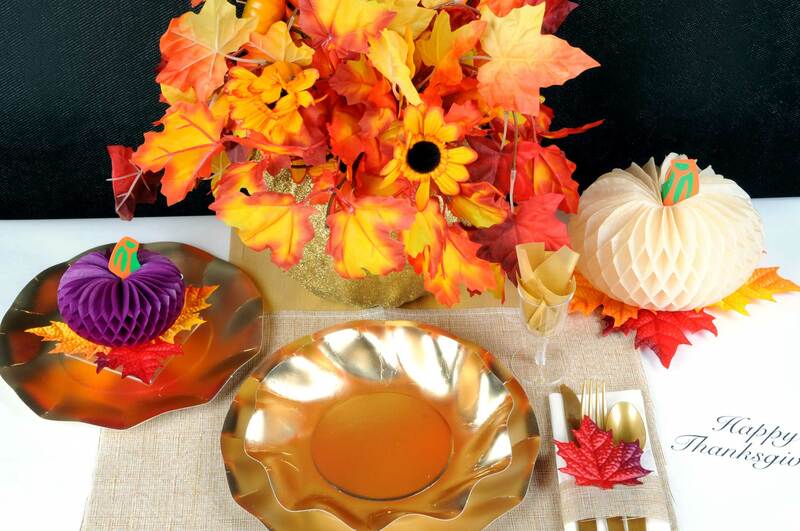 You may be thinking that you don’t want to put the time, effort & money in to decorations that go on to the table. But, don’t worry! 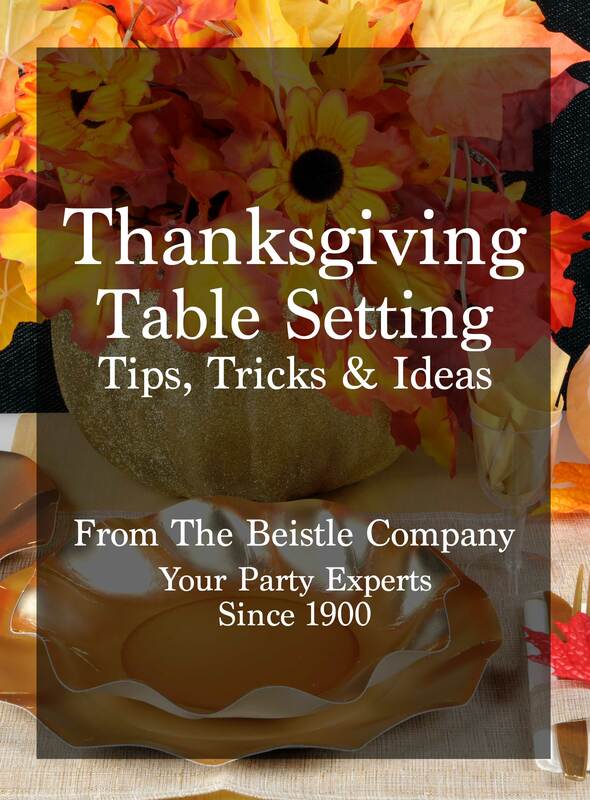 With these tips & tricks from Beistle, you can have your table looking chic, sophisticated & modern – without spending too much time, effort or money to do so. Has anyone else noticed the trend of using gold decorations? Whether it’s home decor, rustic accents, party decorations and, yes, even table decorations, I have been seeing it everywhere. 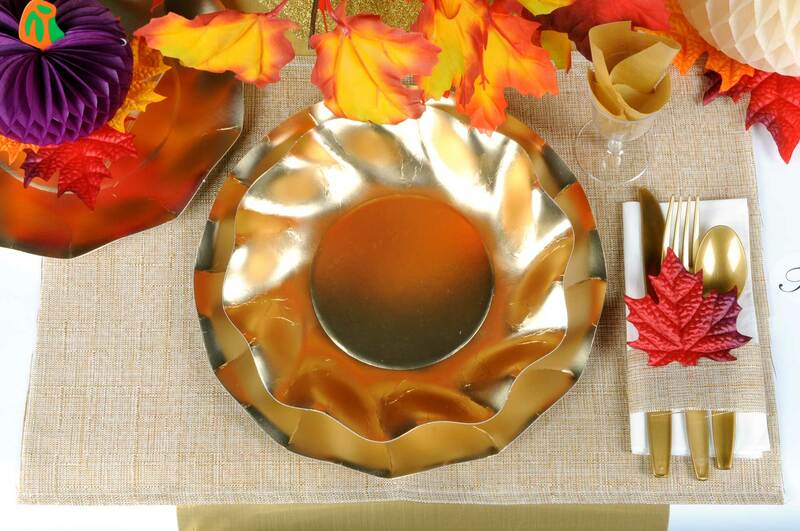 That’s why I chose to create a table setting pairing some of our finest fall & gold decorations. Hint – there’s even a fun, simple DIY project to complete the ensemble. I’m going to briefly cover seven different areas of a table setting & give you ideas for how you can customize those areas to fit your style. A simple white fabric or paper tablecloth is great because it matches literally any decorating theme or style you choose to go with. On top of that, I used a section of our (57601-GD) Lamé Table Runner and placed it perpendicular to where I was going to lay the placemat. If you choose to go the rustic-chic direction like I did, it’s perfect paired with a little burlap. For mine, I used our (52136) Faux Burlap Table Runner and cut it in to sections, getting multiple placemats from only one runner. Simple, trendy & inexpensive to do. Who says you can’t use paper plates for your Thanksgiving dinner? Just because they are paper, doesn’t mean that they can’t still look elegant & upscale. 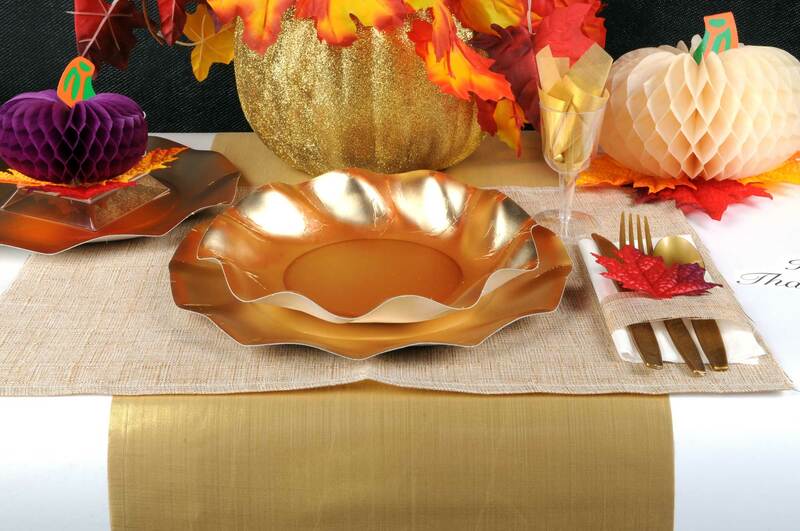 The (59311-GD) Satin Gold Large Plates, (59211-GD) Satin Gold Medium Plates and (59511-GD) Satin Gold Medium Bowls from PartyCheap.com are wonderful options if you’re going for this look. They’re durable, shiny and the best part – easy to clean up – so that you can get to that post-Thanksgiving-dinner-nap sooner & spend less time on clean up. A simple & inexpensive way to dress up each person’s serveware is to add a small embellishment. I carefully folded each napkin in half & placed the serveware on top. Then, I took scrap pieces from the Table Runner (That I had used for the placemats) and wrapped it around the items. Last, I used a fabric leaf from our (90849) Autumn Leaves and stuck it in to the burlap. Simple, yet adds that perfect touch of color. Planning to serve a bit of wine during the meal? If so, the (N35780686) Clear Mini Wine Glasses are a great choice. Dress them up with a piece of Lamé to match the rest of the color scheme. If you have some extra room on the table, add a few extra decorations to help fill up the space. Inexpensive, tissue pumpkins are a great option, as well as fabric autumn leaves. I used items (90849) and (01101). 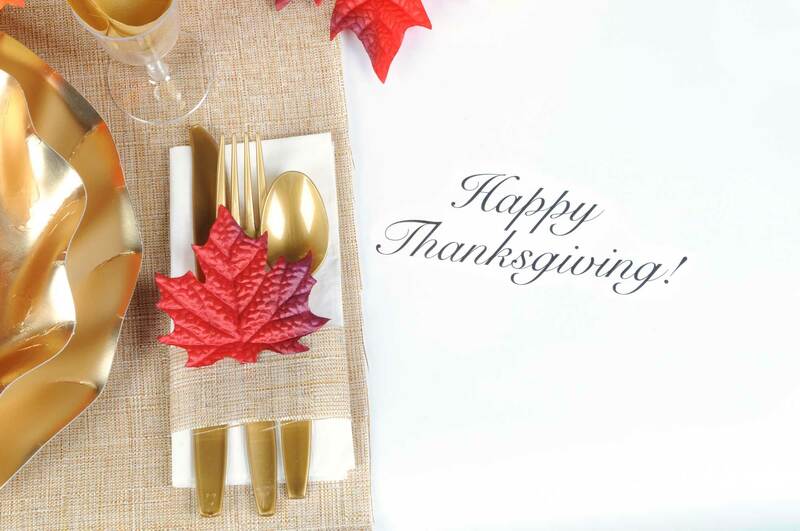 A fun way to personalize each place setting is to add a note to each seat. Since I used white paper for my tablecloth, I was able to write directly on to the table. I simply wrote “Happy Thanksgiving,” but you could be more creative and write whatever you want! A few weeks ago, I was given some plastic pumpkins that someone was getting rid of. They’re a little beat up, but who cares! I automatically thought that a little paint and/or glitter would spruce those things back up. I was right. 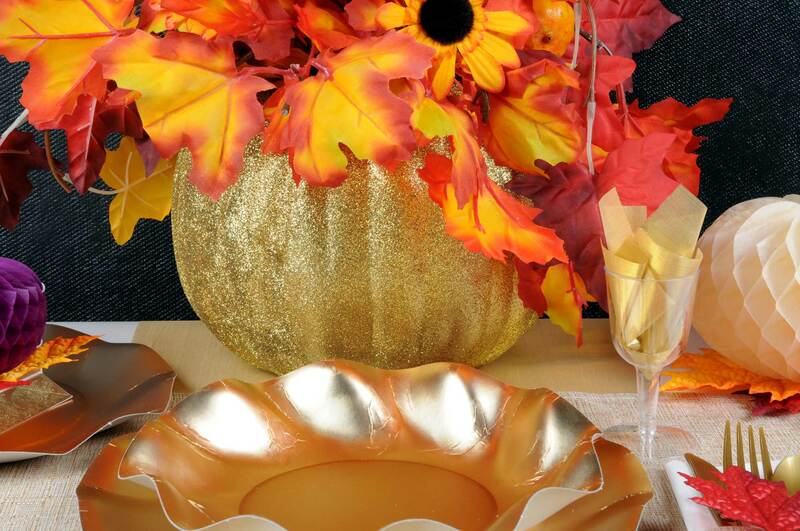 A gold-glittered-pumpkin was just what this project called for. (This was super easy to do). All I did was brush on a little craft glue (in sections), and then sprinkle that section with my glitter. I then filled the inside with pieces of our (90661) and (90845) Fall Garlands. I hope you are able to utilize a few of these ideas at your own Thanksgiving! Thanks so much for reading & supporting your friends at Beistle! 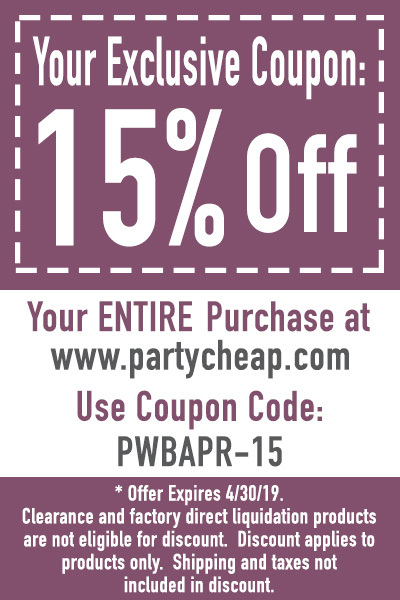 To purchase the items from this post, visit www.partycheap.com. Plan a Taco Night with Decorations from Beistle! Employee Spotlight – Meet Our #BeistleStars!